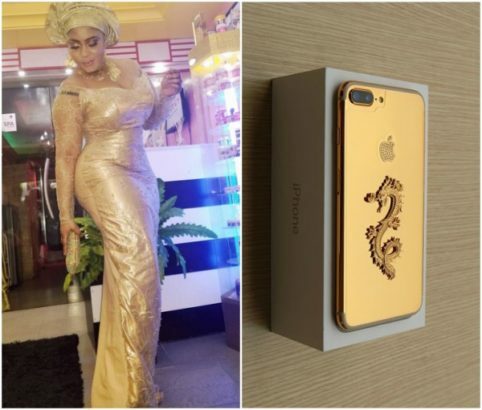 Nollywood actress, Biodun Okeowo who promised to reward anyone who has information about her stolen gold plated iPhone 7 has found her phone. According to the actress, the phone which was stolen at a party was returned today. Good morning everyone. Happy New month. As God surprised me this morning with my lost IPhone, i pray God will surprise y’all too with all you have lost or looking up to Him for. The Good news!!! My IPhone has been returned this morning….i mean just now. Let’s not go into stories….i am happy and thankful..
Good morning everyone. Happy New month. As God surprised me this morning with my lost IPhone, i pray God will surprise y'all too with all you have lost or looking up to Him for. The Good news!!! My IPhone has been returned this morning....i mean just now. Let's not go into stories....i am happy and thankful.. #Olainukan#begood#GodisEverFaithful# Thank you everyone, I am grateful, thank you @instablog9ja Thank you @seunoloketuyi Thank you @jfashofficial Thank you @queenfmg_ Thanks @officialobaaramusic Thanks @officialkunleadegbite Thanks to everyone who DM me...i really appreciate it, God bless you all... Happy New month.